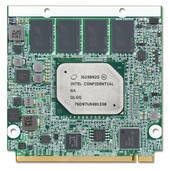 Qseven is an off-the-shelf Computer-On-Module that integrates all core components of a common PC and is mounted onto an application specific carrier board. Qseven modules have a standardized form factor of 70mm x 70mm or 40mm x 70mm and have specified pinouts based on the high speed MXM system connector. The Qseven module provides the functional requirements for an embedded application. These functions include, but are not limited to, graphics, sound, mass storage, network and multiple USB ports. A single ruggedized MXM connector provides the carrier board interface to carry all the I/O signals to and from the Qseven module. 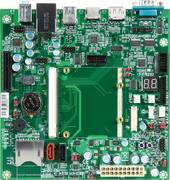 Mini-ITX Form Factor Carrier Board for Qseven Module with GbE, HDMI, VGA and dual LVDS.